This evening, we say goodbye to Sam and Eddie from the Take Two TV show. While the alphabet network hasn’t cancelled the summer TV show, it does seem highly unlikely that they’ll renew it for a second season. What do you think? 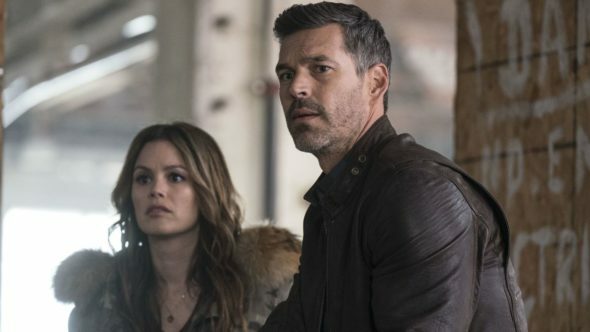 An ABC crime comedy-drama from Castle creators Terri Edda Miller and Andrew W. Marlowe, Take Two stars Rachel Bilson, Eddie Cibrian, Xavier de Guzman, Aliyah O’Brien, Alice Lee, and Jordan Gavaris. The story centers on actress Sam Swift (Bilson), who, after an epic, viral breakdown has to rehab her image and rebuild her career. She asks to shadow lone-wolf private investigator, Eddie Valetik (Cibrian), who resents the gig, but soon finds her acting experience comes in handy on the job. The Take Two series debuted in June and got off to a poor start, attracting a 0.50 rating in the 18-49 demographic with 3.36 million viewers. The ratings dropped lower during the course of the season and perked up occasionally. To be fair, the series was pre-empted a few times over the course of the season which surely didn’t help things. Take Two also had to sometimes contend with football game pre-emptions and delays in some markets. Those didn’t help the ratings but the show just didn’t attract much of an audience right from the start. There were some boosts in delayed viewing but, delayed viewing doesn’t typically generate commercial revenue for a network. It seems unlikely that ABC will renew Take Two for a second season but, because it’s a summer show, there’s a chance they may decide to revamp the program a bit and give it another try in 2019. What do you think? Do you like the Take Two TV show? Would you like to see it be renewed for a second season or, do you think it should be cancelled? Boy Band: ABC Series a Disappointment; Would You Watch Season Two? Yes, the show improved a lot as more episodes aired. I would definitely watch season 2 of Take Two. Fills the void left when Castle ended. Smart, funny show. Renew. I enjoyed this show and I hope it continues. It was a fun show, with great chemistry between the actors. Definitely renew for the summer! Yes this show should continue! Put it in a better time slot and don’t pre-emp it and give it a chance. At least it has some humor and stupid fun instead of all the dark police dramas that are on now days. Please bring it back!! Take Two is a really fun entertaining show. Love the characters & the stories. Please give fans another season! I really like this show. Please renew it!